Located in a sought-after location; this outstanding six-bedroom detached family home encapsulates the ideal of modernity from its streamlined, modular design to its minimalistic open plan interior. Combining both a luxury finish with the convenience of a free-flowing spatial design, this property is truly stunning. This attractive property embraces a clever design radiating modernity through its striking composition, distinctive design of white rendered exterior walls with punctuating grey framed windows, flat roof and sits within a large plot, of which is home to; beautifully landscaped front and rear gardens, wrap around stone paving, a detached double garage, large private tar and chip surfaced driveway and all approached via a motorised sliding security gate. Upon entering, it is evident the entirety is transcending and has been crafted and finished to a high standard with hardwood Oak flooring, ironmongery, Spanish Oak doors and French polished on site, oversized skirtings, multiple aspect solid windows, sliding doors, modern fixture and fittings, brand new carpets and a neutral grey colour palette throughout. With the total square footage sitting at 5552, the vast amount of space this property offers is elevated with the extensive use of multiple aspect ribbon windows and sliding doors. Entering into the first reception hall, one of three reception rooms, this versatile, atrium style space offers itself as either a dining room or additional living area and benefits from floor to ceiling sliding doors capturing the picturesque landscape beyond. Following through, the open plan kitchen/dining area exudes opulence from large multiple aspect sliding doors to the tailor made fitted kitchen with downlighting. The kitchen has been crafted to a high standard and comprises of several bespoke wooden fitted units, white quartz stone work surfaces, a breakfast bar, large central island and full length glass door providing access to the side of the property. Several contemporary appliances have been integrated throughout; Siemens five ring gas hob fitted within the island, wine cooler, two double Siemens ovens, separate full length fridge and freezer, Siemens dishwasher, Blanco sink. Adjoining, a utility room is located of which comprises wall and base units, stainless steel sink and integrated AEG washing machine. The dining area is a large space and could comfortably accommodate a large dining table with chairs. The multiple, floor to ceiling, sliding doors allow the room to be awash with light whilst also providing spectacular views out to the garden. The floor is marble ceramic, complete with under floor heating, of which spans the entirety of the ground floor reception rooms. Following through, the third reception room is located to the rear of the property. This family room, of which is carpeted, is a beautiful space and with sliding doors spanning the width of room, the entirety of the landscaped garden has been captured perfectly. Access is given to the decked area of which abuts the rear of the property. 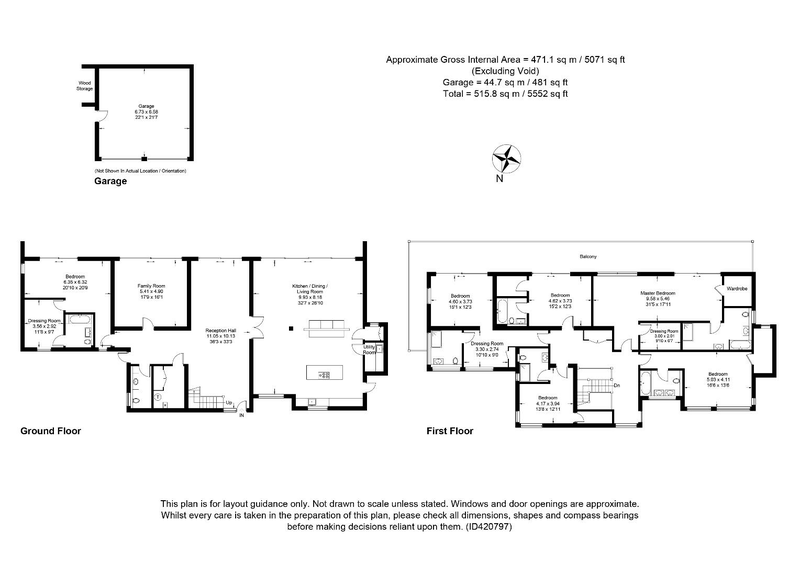 Following through, the far left hand side of the ground floor accommodates a fourth bedroom of which comprises a large separate dressing room and en suite. This space benefits from being carpeted and sliding doors leading out to the decked patio. The en suite bathroom has been finished to a high standard and follows the modern colour palette this building exudes; it comprises of an integrated bath, with detachable shower, wall hung toilet and curved wall hung basin with wood vanity unit. The ground floor also gives access to a downstairs cloakroom of which comprises a wall hung toilet, curved wall hung basin with wood vanity unit and ceramic marble effect tiling. An additional large storage cupboard houses the Worcester Bosch boiler, hot water tank and all facilities in terms of electrics and under floor heating. A full length glass door is also located in the corridor providing access to the side of the property. The finely designed bespoke Oak and glass wrap around staircase, within the entrance hall, gives access to the first floor where five double bedrooms are situated. The landing space emphasises the expanse of the property with light bouncing from the ribbon windows to glass banisters, whilst offering ample storage within the integrated cupboard space. The master bedroom, located to the rear, boasts multiple aspect floor to ceiling windows, separate his and hers walk in dressing rooms/wardrobes and a generously sized en suite of which comprises; an integrated bath, wall hung toilet, large double walk in shower and his and hers wall hung basin with wood vanity unit. Additional sliding doors provide access to the decked terrace/balcony – a perfect additional area of which can accommodate outdoor furniture to enjoy the morning sun or for alfresco dining. The clever design of glass banister and same level flooring allows the living space and garden to run seamlessly from one another – a typical feature of modern design. The additional four bedrooms are in keeping with the contemporary feel throughout boasting brand new grey carpets, neutral décor whilst modern appliances and fittings feature. All of the en suites are designed with high quality materials and boast either walk in double showers or integrated bath with detachable showers. All rear bedrooms feature sliding doors allowing natural light to flood the room encapsulating garden views whilst providing access to the terrace/balcony. The elevation of these rooms, along with the continual ribbon windows and sizeable sliding doors, allow for a plenitude of countryside views, a simply stunning feature this property offers. Further benefits; underfloor heating throughout on both levels, eye-lighting throughout, Texecom alarm system, panic alarm buttons in the master bedroom. South Holmwood is a semi-rural location boasting spectacular views and countryside and approximately 3 miles south of the popular town of Dorking. The village of Beare Green, which is about 5 miles, provides local shops together with a railway station which services trains to London Victoria. The town of Dorking provides an excellent range of shops together with leisure amenities and train services to London Victoria and Waterloo. There are a number of excellent schools within the area, both state and private, which include St John’s, Leatherhead, Boxhill at Mickleham and Cranleigh School. The A24 provides access to the M25 at Leatherhead, both Gatwick and Heathrow airports and the National Motorway Network. The property lies just to the south-east of the Surrey Hills, which provide some of the finest walking and riding countryside in the area. Select when the best time is for you?